I know I should be blogging about the marvelous party I was at this weekend but I’ve decided to fix my shoulder issues in my new anglaise and then take new photos before I blog about it….but in an effort to not totally neglect this blog I give you the next installment of Alice’s Attic. I thought I’d take a break from all the black on black (don’t worry there’s more coming) to take a look at this lovely 1910’s gauze gown. It’s a very delicate ivory fabric with some beautiful embroidery. This dress we didn’t even know was there till Alice went to check that there weren’t in fact MORE things on the bed…and oh look there were! It has some seriously interesting fastenings. The front has beaded tassels that hang from fabric pieces that cross over the body and snap at the waist line. The tassels themselves look like some bizarre macrame project. It has two tiers of beautiful embroidery. There are clear beads sewn in to add weight to the hem. We were trying to figure out just what they were made of. One of the embroidery motifs. The inside has a wide petersham waistband that hooks in the CF. Alice had to hold it on as it was TOO BIG for Amanda. Notice the funny beaded tassels. Some kind of early plastic, but not exactly sure what. I would love to hear if anyone had any idea what the beads are. They feel like some kind of early plastic, but I don’t think they’re bakelite as they don’t have the formaldehyde odor when you rub them that bakelite usually has. Perhaps celluloid? This is outside my area of expertise. I don’t really know what this funny little wrap-thing was called..so I’m going with the overly generic mantle. Once again being modeled by the ever amazing Mandie. The mantle closes with hooks and eyes up the center front. It has no side panels just points down the front and back. The “sleeves” are lace but as there is nothing under your arm there isn’t really an under-arm seam. 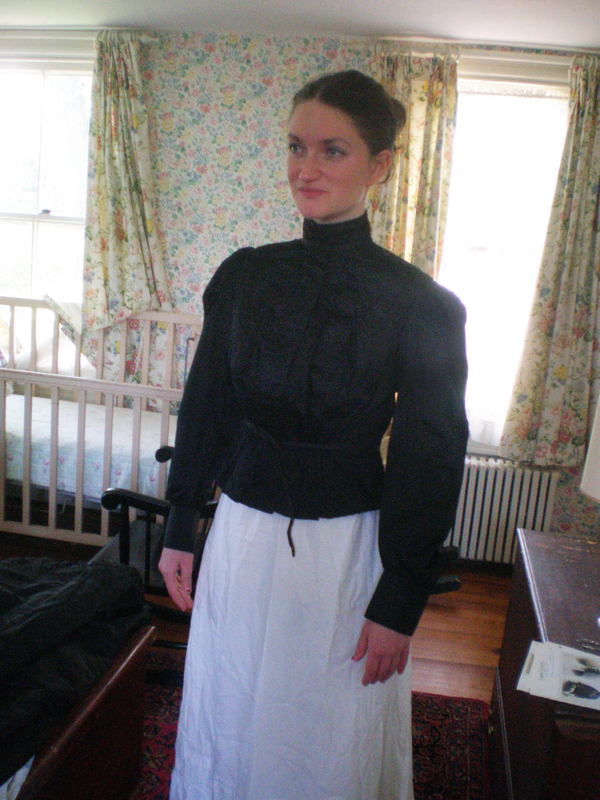 It originally had an elastic waist band that we think closed around the waist to pull the back panel tight to the body. But somewhere in it’s history someone tacked it up into the back. It’s half cape and half bodice. It has pleats of lace and taffeta forming a V up the back. Delicate and very flattering. The lace sleeve with white under it. The center front tabs have circles on the bottom. Both for decoration and for weight. Folding back the lace pleats on the CB you can see the decorative cording below. I’m very interested in pattering this one as it’s relatively one-size-fits-most. I was able to wear it with no problems and I’m easily twice Mandie’s size. I might add a wee bit of width to the center front and center back. As before if you know anything about this garment specifically or have questions please ask! I can always invade Alice’s house again for more photos. This is the the first in what will be a series of posts exploring a pile of gorgeous antique clothing my friend Alice’s Dad magically pulled out of their attic. 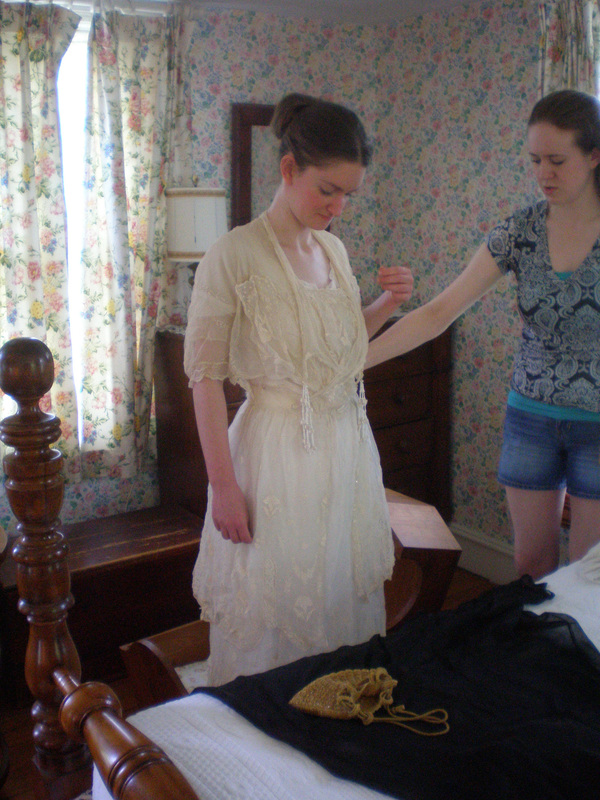 Why no one in my family can magically pull antique clothing out of the attic is something I think should be worked on. Amanda of A Dedicated Follower of Fashion was kind enough (and tiny enough) to model most of this clothing to help us see what it looked like on a real person. I’ve decided to do these posts in a small series as there were a whole bunch of garments and I took a lot of photos of each of them. I wanted to share some detail shots and not just one picture of each. I don’t know about you all but I like me some detail shots! 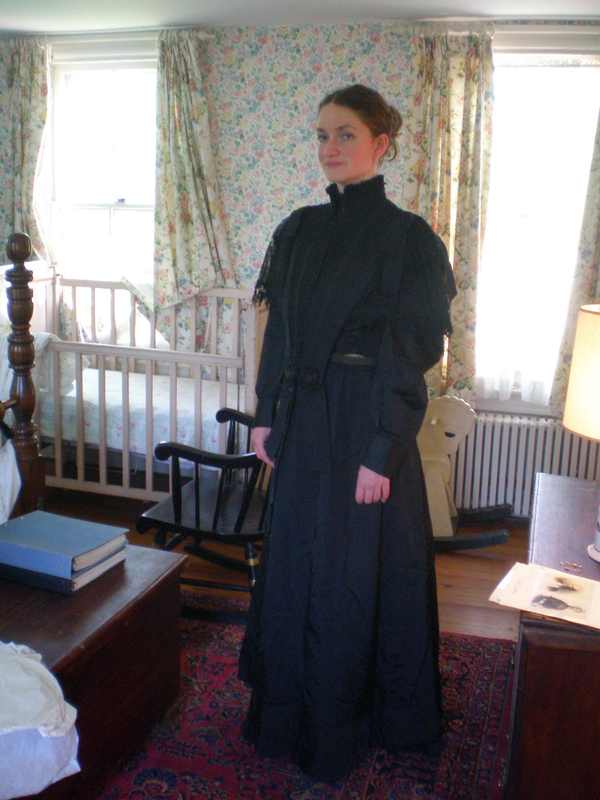 We’re going to start simple here with this lovely Edwardian shirtwaist. Amanda and I think it’s in the 1906-1910 range (roughly) but I’d of course love any input if you have a differing opinion! I apologize for all of the backlighting. The room is lovely in that there’s windows on every side, but on a sunny day…there’s windows on every side. The neck closure is the most interesting part. It’s sewn on one side from the back to the center front. Then it’s unsewn and just wraps around the neck to hook in the back. This allows the blouse to close with a center front fastening and the collar a center back fastening.